LONDON (Reuters) - Award-winning American war reporter Marie Colvin was known for her dispatches from some of the world's most brutal conflicts. 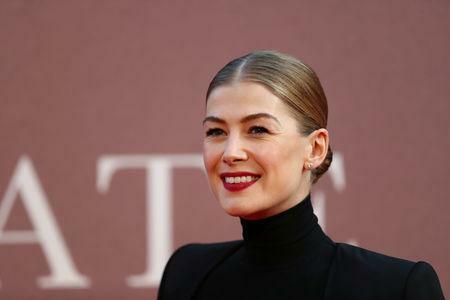 Now a new film starring "Gone Girl" actress Rosamund Pike tells her story about being fearless on the battlefront. Focusing on the last decade of her life, "A Private War" takes audiences to the frontlines of fighting in Sri Lanka, Iraq, Afghanistan, Libya and Syria. Colvin, reporting for Britain's Sunday Times, was killed in Syria in 2012. "I just thought 'My gosh, this is a woman who would be a joy to kind of get people to see'... this complicated, ferocious, driven, ambitious, vulnerable, romantic soul and put that out on screen," Pike told Reuters. "Because... oh yes is she a role model, but a role model in a real way." "Fifty Shades of Grey" star Jamie Dornan plays photographer Paul Conroy, who accompanied Colvin on trips and was with her when she died in Homs while covering the Syrian conflict. "It gives you a far more sort of heightened respect for the people who go to these places and try to report the actual truth of what's happening," Dornan said. Conroy, who worked as the set photographer for the film, said the actors had caught "the essence" of his relationship with Colvin. "(Colvin) was a force of nature... It was like peeling an onion back, she just kept going further and further and further in... until we were at what she considered the heart of it," Conroy said. "In this world of sort of fake news and with journalism under attack... I think it's both a homage to Marie (and also) a homage to journalism and the importance of journalism," he said. Heineman said he wanted to make the film, shot in Jordan for the war zone scenes, as "authentic as possible" and cast Syrian refugees who tell their stories. "We spent a tonne of time researching every single detail, looking at every image we could to try to recreate these war zones but a huge part of that were the people we put on screen," he said. "Most of the extras were non-actors, refugees from those countries who are living in Jordan... They are telling their real stories... Ultimately it created a real heightened sense of emotion on set."